I grated the cheese instead of slicing it so it over-melted. Which means you can’t really see the cheesy, oozy goodness. But trust me. It’s there. 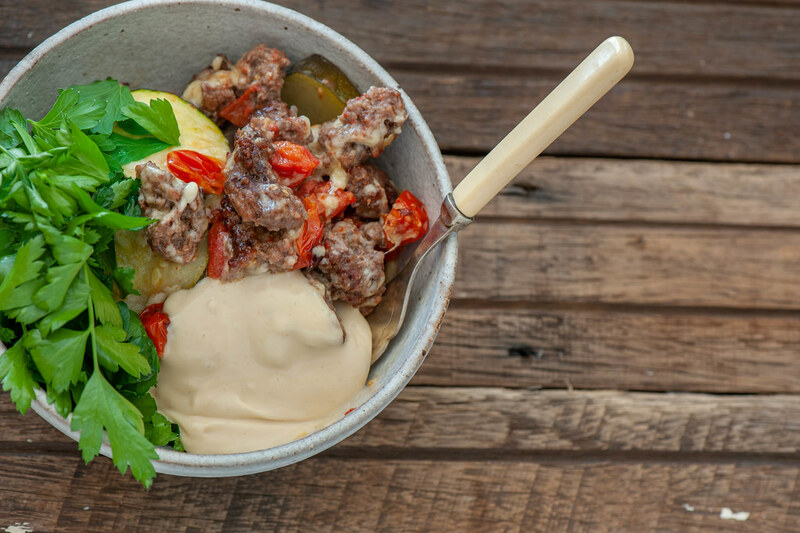 These burger bowls are a big big favourite in our house on a Friday night. I love them because they’re so quick and it all just cooks in one pan – so minimal cleanup. My Irishman loves the combo of the meaty beef and the buttery roast zucchini. And I must tell you – the roast zucchini with the cheese on it is so so good. Definitely my favourite part! 1. Turn your oven to 250C (480F). Place zucchini and tomatoes in a large roasting tray. Drizzle with a little oil and a pinch of salt. Roast for 5 minutes. 2. Break meat into bite sized chunks and scatter over the zucchini and tomatoes. Roast for another 10 minutes. 3. Stir. Scatter over cheese and cook for another 5 minutes or until the meat is cooked through and the cheese has melted. 4. Divide between two bowls. Top with salad / parsley and a big dollop of mayo. WINE MATCH: A gutsy red like Shiraz, Cabernet or Zinfandel. vegetarian – replace meat with extra veggies like eggplant, mushrooms and peppers. Or use chickpeas. And consider adding more cheese. dairy-free – just skip the cheese and serve extra mayo. Or add some chopped bacon to brown instead of the cheese. 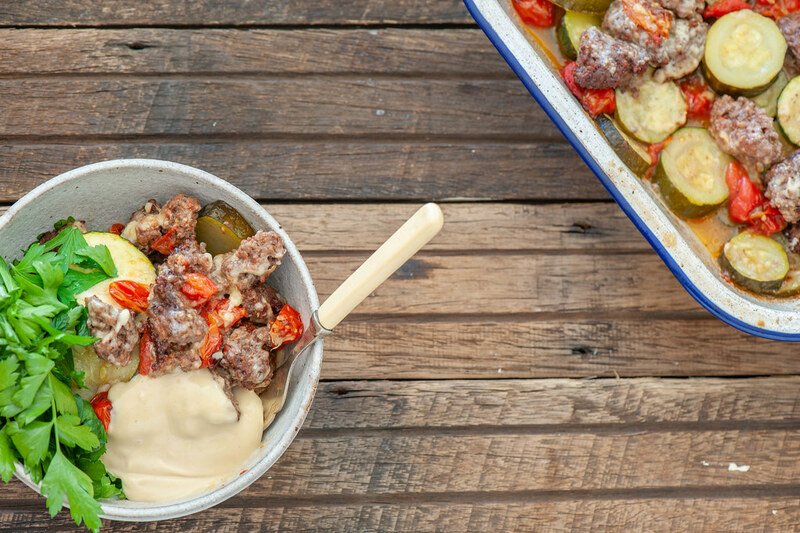 Or for a lux version serve burger bowls with finely sliced prosciutto or salami. more substantial (carb lovers) – burger buns! Or add torn sourdough chunks to roast with the meat. more substantial (low carb) – extra mayo, roast nuts or almond burger buns. more veg – see the vegetarian options. different accompaniments – I’ve kept it simple just serving with mayo, but feel free to add any of your usual burger accompaniments. Pickles are lovely, or mustard and you could always go for some ketchup if you don’t mind the sugar. Oh and for me sauerkraut is a must! different meat – any ground meat will work. Or try sausages or chorizo for something different. old school burgers – replace parsley / salad with finely sliced iceberg or cos (romaine) lettuce. different cheese – I’m keen to try it with crumbled blue cheese added at the end. OR feta would be good too. Any melting cheese will work in place of the cheddar. different greenery – I like the parsley leaves but you could serve it on a bed of any cooked greens. And make sure you see the old school burgers’ option above. Shredded kale is a fave. cherry tomatoes – either halve and cook in the oven for about 30 minutes (180C / 350F) OR just cook in a pan with a little oilve oil. In either case store in an airtight container in the fridge for a few weeks. Or freeze the cooked tomato for longer periods. salad leaves / parsley – are highly perishable. My first path would be to use them for another meal (salad for breakfast!) but if that isn’t possible you can pop them in the freezer. They will wilt down but can then be used anywhere you’d use wilted greens. At least this way they won’t go slimy. mayonnaise – unopened in pantry or once opened will keep for months in the fridge. Yes! Just cook as per the recipe but keep the parsley and mayo separately. Leftovers will keep in the fridge for 2 weeks or can be frozen. To serve, warm in the oven (200C / 400F) for 10-15 minutes or pan fry everything until hot.